Fast, violent jewellery theft has become more widespread of late. 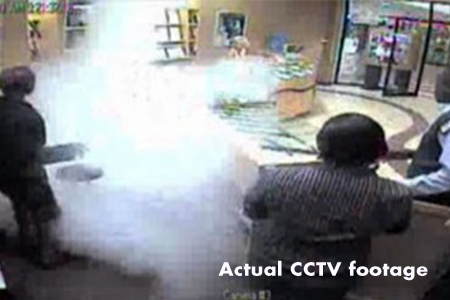 Concept Smoke Screen’s security fog solutions are at the forefront of the battle against this increasingly prolific breed of daytime raid as this footage from a jewellery store in a shopping centre in Johannesburg shows. Watch the actual footage of this dramatic event in our video library. Also on our youtube channel. It’s an all too familiar story – robbers run into a jewellers, armed and disguised. Smash the cabinets, grab the rolexes and rings, casually walk our of the shopping centre and speed off in their vehicles. This all generally happens within a very short timeframe, a couple of minutes tops. Let’s turn the tables for a moment. Robbers run into a jewellery store, armed and disguised. The security smoke system goes off. The robbers stop in their tracks, turn and leave. Attempted robbery over in seconds. The police alerted, enough CCTV footage for identification and a much better outcome. Get protected today! Call us on +27 (86) 111 2816 and arrange for a free consultation.